Not to be confused with Ginette Reno. Janet Wood Reno (July 21, 1938 – November 7, 2016) was an American lawyer who served as the Attorney General of the United States from 1993 until 2001. President Bill Clinton nominated Reno on February 11, 1993, and the Senate confirmed her the following month. She was the first woman to serve as Attorney General and the second-longest serving Attorney General in U.S. history, after William Wirt. Reno was born and raised in Miami, Florida. After leaving to attend Cornell University and Harvard Law School, she returned to Miami where she started her career at private law firms. Her first foray into government was as a staff member for the Judiciary Committee of the Florida House of Representatives. She then worked for the Dade County State Attorney's Office before returning to private practice. She was elected to the Office of State Attorney five times. Reno was born in Miami, Florida. Reno's mother, Jane Wallace (née Wood), wrote a weekly home improvement column for The Miami News under a male pseudonym and later became an investigative reporter for the paper. Her father, Henry Olaf Reno (né Rasmussen), was an emigrant from Denmark and a reporter for the Miami Herald for 43 years. Janet Reno had three younger siblings: Mark; writer Robert Reno; and Maggy Hurchalla. The family moved to a property near the Everglades when Reno was 8 years old, living in a house Reno's mother built. The house originally sat on 21 acres of property, some of which the family later sold to pay for the children's education. Reno attended public school in Miami-Dade County, Florida, where she was a debating champion, and was salutatorian at Coral Gables Senior High School. In 1956 she enrolled at Cornell University, where she majored in chemistry, became president of the Women's Self-Government Association, and earned her room and board. After graduating from Cornell, Reno enrolled at Harvard Law School, one of only 16 women in a class of 500 students. She graduated from Harvard in 1963. From 1963 to 1971 Reno worked as an attorney for two Miami law firms. In 1971, she joined the staff of the Judiciary Committee of the Florida House of Representatives. The following year, Reno ran for a seat in Florida's state house. She did not win. In 1973, she worked on a project to revise the state's system of rules and regulations for criminal procedures. Later in the same year, she accepted a position with the Dade County State Attorney's Office led by Richard Gerstein. Shortly after joining the office, Gerstein made Reno his chief assistant. Reno did not try any cases during her time working for Gerstein. She worked for the Judiciary Circuit, and left the state attorney's office in 1976 to become a partner in a private law firm, Steel, Hector & Davis. Gerstein decided to retire in 1977, creating a vacancy with Florida governor Reubin Askew to appoint a successor. Reno was one of two candidates Gerstein recommended to replace him. In January 1978, Governor Askew appointed Reno the State Attorney for Dade County (now called Miami-Dade County). She was the first woman to serve as a state attorney in Florida. She was elected to the Office of State Attorney in November 1978 and was returned to office by the voters four more times. Reno ran as a liberal, pro-choice Democrat even though Miami-Dade was a conservative county. Reno did not always face serious challengers, although in 1984 Cuban-American lawyer Jose Garcia-Pedrosa ran against Reno, and picked up the endorsement of the Miami Herald editorial board. In spite of his support among Miami's Hispanic voters, Reno won the election decisively. The office she led included 95 attorneys and an annual caseload that included 15,000 felonies and 40,000 misdemeanors. As state attorney, she developed a reputation for ethical behavior, going so far as to purchase a car at sticker price to avoid the appearance of impropriety. She established a Drug Court which was later replicated in other parts of the country. She worked actively in various civic organizations, including the Miami Coalition for a Safe and Drug Free Community and the Beacon Council, which was formed to address Miami-Dade's economic development. In May 1980, Reno prosecuted five white policemen who were accused of beating a black insurance salesman, named Arthur McDuffie, to death. The policemen were all acquitted. During the resulting 1980 Miami riots, eighteen people were killed, with looters in Liberty City angrily chanting "Reno! Reno! Reno!" Reno met with nearly all of her critics, and a few months later, she won reelection in a landslide. During Reno's tenure as state attorney, she began what the PBS series Frontline described as a "crusade" against accused child abusers. Reno "pioneered a controversial technique for eliciting intimate details from young children and inspired passage of a law allowing them to testify by closed-circuit television, out of the possibly intimidating presence of their suspected molesters." Several of those prosecuted by Reno were either acquitted or later released by appellate judges. One defendant, "a 14-year-old boy, was acquitted after his attorneys discredited the children's persistent interrogations by a psychologist who called herself the 'yucky secrets doctor'. Another was freed by a federal appeals court after 12 years in prison." In 1984, Frank Fuster, the owner of the Country Walk Babysitting Service, in a suburb of Miami, Florida, was found guilty of 14 counts of abuse and sentenced to prison with a minimum of 165 years. Fuster was convicted based in large part on the testimony of his 18-year-old wife, Ileana Flores, who pleaded guilty and testified against him. According to a 2002 episode of Frontline, Flores maintained that he was innocent. In 1989, as Florida state attorney, Reno pressed adult charges against 13-year-old Bobby Fijnje, who was accused of sexually molesting 21 children in his care during church services. The charges were driven by the testimony of children interviewed by mental-health professionals using techniques later discredited as a contemporary version of witch hunts. During the trial, the prosecution was unable to present any witnesses to the alleged abuse. After two years of investigation and trial, Fijnje was acquitted of all charges. Although Reno personally opposed the death penalty, her office secured 80 capital punishment convictions during her tenure. In 1993, President Bill Clinton Reno nominated to serve as the United States Attorney General. Both of his previous choices, Zoë Baird and Kimba Wood, faced problems because both had employed undocumented immigrants as nannies. Upon Clinton's announcement on February 11, 1993 that he had selected Reno for Attorney General, he said he wanted to hire a woman for the job but had also considered multiple male candidates. Clinton said he had discounted Reno early in his search because she did not have experience in the Justice Department or federal law, but ultimately he came to understand that she had experience with a variety of criminal law issues from her role as State Attorney. On March 11, 1993, Senate confirmed Reno by a vote of 98 to 0. She was sworn in the next day, becoming the first woman to serve as U.S. Attorney General. As Attorney General, Reno oversaw the Justice Department and its 95,000 employees. Reno remained Attorney General for the rest of Clinton's presidency, making her the longest-serving Attorney General since William Wirt in 1829. In 1994, Reno tasked the Justice Department with compiling a report on DNA exoneration. The science was still new at that point in time. Reno commissioned the report after reading about the exoneration of a death row inmate. She wanted to know how many cases existed like the one she read about and what the Department of Justice could learn from it. The resulting report concluded there was a strong possibility that many more wrongful convictions which could be cleared with DNA evidence existed. Reno changed policies on how to interview eyewitnesses and laboratory protocols in response. The 51-day Waco siege standoff and resulting 76 deaths—the Branch Davidians—in Waco, Texas. (The standoff began on February 28, 1993, twelve days before Reno was installed as Attorney-General.) Reno in congressional testimony stated that she authorized the FBI assault on the Branch Davidians because of reports that militia groups were en route to Waco during the standoff "either to help [Branch Davidian leader David] Koresh or to attack him." The FBI had also, erroneously reported to Reno that children were being abused at the compound. Reno publicly expressed her regret of the decision to storm the compound, and accepted full responsibility for the loss of life. The antitrust division brought suit against the software company Microsoft for violation of the Sherman Antitrust Act. The Justice Department alleged Microsoft was bundling its browser with its operating system to decrease competition for other browser makers. Microsoft executive Steve Ballmer responded to the suit saying "To Heck with Janet Reno," a comment for which he later expressed regret. The case was ultimately settled in 2001, after Reno's departure. Prosecution resulting in the conviction of 21 of the Montana Freemen, a group that did not believe there should be government above the county level, after an 81-day armed standoff which ended without loss of life. In March 1996, Montana Freemen began a 61-day standoff with the FBI after the FBI arrested three members of the group for refusing to leave property from which they had been evicted. Following the tragedy at Waco, the FBI was determined to avoid violence, and Reno assured the public the FBI was looking for a peaceful solution to the standoff. Capture and conviction of Ted Kaczynski, the Unabomber. Capture and conviction of Timothy McVeigh and Terry Nichols for the Oklahoma City bombing. Capture and conviction of those who conducted the 1993 World Trade Center bombing, resulting in life-sentences of Sheik Omar Abdel-Rahman and four conspirators. Leak to the news media regarding Richard Jewell that led to the widespread and incorrect presumption of his guilt in the Centennial Olympic Park bombing. She later apologized, saying "I'm very sorry it happened. I think we owe him an apology. I regret the leak." The government's unsuccessful defense of the Communications Decency Act, which culminated in the Supreme Court decision Reno v. American Civil Liberties Union. Identification of the correct suspect (Eric Rudolph) in the Centennial Olympic Park bombing and other bombings, who remained a fugitive throughout her tenure. Rudolph was apprehended in 2003 and pleaded guilty to the attacks. Capture and conviction of Mir Qazi for the 1993 shootings at CIA Headquarters. The armed seizure of six-year-old Elián González and his return to his father, who eventually took him home to Cuba; Elián's mother and stepfather had died in a dangerous trip by sea, and though his U.S. relatives had lost custody to his father in court, local officials did not enforce the ruling. Reno made the decision to remove Elián González from the house of a relative. In 1994, Reno appointed Robert Fiske special counsel to investigate Bill Clinton 's involvement in Whitewater, a controversy stemming from Clinton's business dealings during his time as Governor of Arkansas. Fiske wrapped up his criminal investigation within six months, and found no link between Whitewater and the suicide of former Deputy White House Counsel Vince Foster. Congress reauthorized the investigation and in August, 1994, a panel of judges from the U.S. Court of Appeals overseeing the special counsel refused to reappoint Fiske. The panel considered it a conflict of interest for Fiske to investigate Clinton because Reno, a member of the Clinton Administration, appointed Fiske. Instead, the panel appointed former member of the Reagan and Bush Administrations Ken Starr to continue the Whitewater investigation. Starr concluded the Whitewater investigation in December 1997 due to insufficient evidence. The following month, Starr received permission from Reno to expand his probe turned his probe into conduct related to the Paula Jones and Monica Lewinsky affairs. Starr's Report, issued in September 1998, listed eleven grounds for impeachment against Clinton. In 1998, the House Government Reform and Oversight Committee, in a party line vote, voted to recommend the House cite Reno for contempt of Congress for not turning over two internal justice department memos related to a campaign finance controversy during the impeachment of President Bill Clinton. Reno contended she refused to turn over the documents sought because the documents would reveal prosecutor strategy in an ongoing investigation. Reno argued her actions were in defense of the principle that prosecutors should be free of political influence. The full House of Representatives never voted on the resolution and the documents were turned over to the House. Reno ran for Governor of Florida in 2002, but lost in the Democratic primary to Bill McBride 44% to 44.4%. Voting problems arose in the election, and she did not concede defeat until a week later. After her tenure as United States Attorney General and her unsuccessful gubernatorial bid, Reno toured the country giving speeches on topics relating to the criminal justice system. On March 31, 2006, she spoke at a criminology conference at the University of Pennsylvania. She stated that she believed the education system in the United States needs to be improved, as there is a link between the quality of education and the crime rate. She also believed that too much money has been diverted away from the juvenile court system and that the government should find some way to make the juvenile courts work effectively, so as to prevent problems in troubled children and adolescents before these problems are exacerbated by the time they reach adulthood. Reno was a founding member board of directors for the Innocence Project, a nonprofit organization which assists prisoners who may be exonerated through DNA testing, in 2004. By 2013 she was Director Emeritus of the Board of Directors. Glamour magazine named Reno one of its "Women of the Year" for 1993. In 2000, Reno was inducted into the National Women's Hall of Fame. In March 2008, Reno received the Council on Litigation Management's Professionalism Award, which recognizes and commemorates an individual who has demonstrated the unique ability to lead others by example in the highest standard of their profession. On April 17, 2009, Reno was awarded the Justice Award by the American Judicature Society. Eric Holder, Attorney General under the Obama Administration, presented Reno the award. Seth Andersen, Executive Vice President of AJS said the award recognizes "her commitment to improving our systems of justice and educating Americans about our great common enterprise – to ensure equality under the law." The award is the highest given by the AJS, and recognizes significant contributions toward improvements in the administration of justice within the United States. Reno had a higher profile than many of her immediate predecessors. She appeared on the cover of Time and was the subject of a Vanity Fair profile. Late night hosts frequently joked about her height and perceived lack of traditional femininity, and Will Ferrell repeatedly portrayed Reno on Saturday Night Live. In 2001, Reno appeared alongside Ferrell on Saturday Night Live in the final installment of the recurring sketch "Janet Reno's Dance Party". On a 2007 Super Bowl XLI TV commercial, Reno was among the guests at Chad Ochocinco's Super Bowl party. Reno curated a compilation of old-time American songs performed by contemporary artists called the Song of America. Reno worked with her niece's husband on the project, music producer Ed Pettersen. Reno said her goal with the project was to share music with her great-nieces and great-nephews. In 2013, Reno voiced herself for the "Dark Knight Court" episode of The Simpsons. She was depicted by Jane Lynch in Manhunt: Unabomber, a fictionalized account of the true story of the FBI's hunt for the Unabomber. Reno never married and did not have children. Reno took Spanish lessons during her time as state attorney. She remained active after her diagnosis with Parkinson's disease in 1995, including learning to in-line skate the following year. Following her mother's death in 1992, Reno inherited her childhood home. In response to a 1998 Saturday Night Live sketch which portrayed her as lonely, former Justice Department public affairs director Carl Stern said, "Both in Florida and in Washington she has a great many friends whose homes she visits, and she goes to plays, her dance card is full." Reno died from Parkinson's disease on November 7, 2016. She was surrounded by friends and family at the end of her life, including her sister Maggy and her goddaughter. Upon her death, President Barack Obama praised Reno for her "intellect, integrity, and fierce commitment to justice" and President Clinton released a statement thanking Reno "for her service, counsel, and friendship." ^ a b "Janet Reno: From Waco to Elian". BBC News. April 14, 2000. ^ a b c d Driscoll, Amy (November 7, 2018). "Janet Reno's early years in Miami: Peacocks, bare feet, stubborn independence". miami herald. Retrieved September 2, 2018. ^ Hulse, Carl (November 7, 2016). "Janet Reno, First Woman to Serve as U.S. Attorney General, Dies at 78". The New York Times. ISSN 0362-4331. Retrieved November 8, 2016. ^ a b Hightower-Langston, Donna (2014). A to Z of American Women Leaders and Activists. Infobase Publishing. p. 183. ISBN 9781438107929. ^ a b Anderson, Curt (November 7, 2016). "Janet Reno, Former US Attorney General, Dies at Age 78". ABC News. Archived from the original on November 10, 2016. Retrieved November 8, 2016 – via archive.org. ^ a b c "Former US attorney general Janet Reno dies at 78". Fox News Channel. November 7, 2016. Retrieved November 7, 2016. ^ a b c "Janet Reno Biography - life, family, children, school, mother, young, old, information, born, house". notablebiographies.com. Retrieved November 7, 2016. ^ a b c d e f g h i j k l m Weaver, Jay (November 7, 2016). "How Janet Reno handled and bounced back from the biggest cases in her life". miamiherald. Retrieved December 10, 2017. ^ a b "After Rocky Start, Reno is Rock Solid". Miami Herald. ^ a b Zorthian, Julia. "How Janet Reno Got Her Start". Time. Retrieved October 20, 2017. ^ Driscoll, Amy; Weaver, Jay; Brecher, Elinor J. (November 7, 2016). "Janet Reno, former Miami-Dade state attorney and U.S. attorney general, dies at 78". miamiherald. Retrieved October 20, 2017. ^ Labbee, William (November 20, 1991). "Better Dead Than Read?". Miami New Times. Retrieved June 10, 2018. ^ a b c d Jane Mayer (December 1, 1997). "Janet Reno, Alone". The New Yorker. Retrieved June 28, 2016. ^ Smiley, David (May 16, 2015). "McDuffie riots: revisiting, retelling story — 35 years later". miamiherald. Retrieved December 10, 2017. ^ Collins, Glen (December 14, 1986). "Nightmare in Country Walk". The New York Times. Retrieved July 1, 2008. Mr. Fuster was convicted of molesting the children entrusted to his wife's care in their home in the middle-class Dade County suburb of Country Walk, a planned development that was intended to be an idyllic refuge from the anxieties of urban Miami. ^ "Interviews - Dr. Stephen Ceci | The Child Terror". Frontline. PBS. Retrieved January 29, 2015. ^ "IPT Journal - Book Review - "Witch Hunt: A True Story of Social Hysteria and Abused Justice"". Ipt-forensics.com. April 15, 2014. Retrieved January 29, 2015. ^ "Bobby Fijnje - Interview | The Child Terror". Frontline. PBS. May 5, 1991. Retrieved January 29, 2015. ^ "Bobby Fijnje - Fijnje Jury's Letter To Janet Reno | The Child Terror". Frontline. PBS. May 9, 1991. Retrieved January 29, 2015. ^ a b c Lauter, David (February 12, 1993). "Miami Prosecutor Is Atty. Gen. Choice : Cabinet: Janet Reno has a reputation as a politically savvy official. The White House hopes her nomination will end the controversy over previous contenders". Los Angeles Times. ISSN 0458-3035. Retrieved August 27, 2018. ^ a b "Biographies of the Attorneys General". Justice.gov. Retrieved May 28, 2011. ^ Associated Press (March 4, 1993). "Reno's Confirmation Hearing to Start Tuesday". Los Angeles Times. ISSN 0458-3035. Retrieved August 27, 2018. ^ Marcus, Ruth (February 12, 1993). "Washingtonpost.com: Clinton Nominates Reno at Justice". www.washingtonpost.com. Retrieved August 27, 2018. ^ Ifill, Gwen (March 12, 1993). "RENO IS CONFIRMED IN TOP JUSTICE JOB". The New York Times. Retrieved August 27, 2018. ^ a b Dwyer, Jim (November 10, 2016). "Janet Reno Was Unafraid of Science That Could Exonerate the Innocent". The New York Times. ISSN 0362-4331. Retrieved June 23, 2017. ^ "Attorney General Swearing-in Ceremony". C-SPAN.org. March 12, 1993. Retrieved August 27, 2018. ^ Phelps, Timothy M. (November 7, 2016). "Janet Reno, the first woman to serve as attorney general, dies at 78 after years-long struggle with Parkinson's disease". latimes.com. Retrieved August 27, 2018. ^ Rosenbloom III, Joe (October 17, 1995). "Waco: More than Simple Blunders?". The Wall Street Journal. PBS.org. Retrieved June 16, 2010. ^ Lind, Dara (January 5, 2016). "History shows us why the feds aren't going into the Oregon standoff with guns blazing". Vox. Retrieved August 25, 2018. ^ "Janet Reno | United States attorney general". Encyclopædia Britannica. November 7, 2016. Retrieved November 7, 2016. ^ Brinkley, Joel (April 4, 2000). "U.S. VS. MICROSOFT: THE OVERVIEW; U.S. JUDGE SAYS MICROSOFT VIOLATED ANTITRUST LAWS WITH PREDATORY BEHAVIOR". The New York Times. ISSN 0362-4331. Retrieved November 7, 2016. ^ a b Glass, Andrew (April 3, 2014). "Judge says Microsoft violates antitrust act, April 3, 2000". POLITICO. Retrieved June 10, 2018. ^ "The end, sort of". The Economist. December 16, 2009. Retrieved June 11, 2018. ^ "10 dumbest tech PR moves ever". cbs.com. June 18, 2011. Retrieved June 10, 2018. ^ McLaughlin, Eliott C. (November 7, 2016). "Janet Reno's career punctuated by highs, lows". CNN. Retrieved June 11, 2017. ^ "81-day Freemen Standoff Ends Without Bloodshed". tribunedigital-chicagotribune. Retrieved November 7, 2016. ^ a b c Lewis, Danny (March 25, 2016). "Twenty Years Ago Today, the Montana Freemen Started Its 81-Day Standoff". Smithsonian. Retrieved August 25, 2018. ^ a b "Washingtonpost.com: Politics -- The Administration, Janet Reno". The Washington Post. Retrieved November 7, 2016. ^ a b c Blau, Max. "Janet Reno, first female US attorney general, dies". CNN. Retrieved November 7, 2016. ^ "Reno to Jewell: 'I regret the leak'". July 31, 1997. ^ "BBC News | Americas | Fugitive charged with Atlanta bombing". BBC. Retrieved November 7, 2016. ^ globalreach.com, Global Reach Internet Productions, LLC - Ames, IA -. 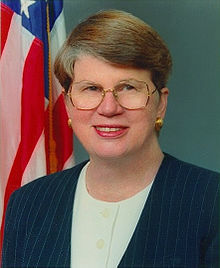 "Janet Reno - JAS". justiceatstake.org. Retrieved November 7, 2016. ^ ABC News (November 9, 2016). "Reno's Time as Attorney General Filled With Difficult Decisions". ABC News. Retrieved September 1, 2018. ^ a b c d "Washingtonpost.com: Whitewater Time Line". www.washingtonpost.com. Retrieved September 1, 2018. ^ a b c "'Clinton Vs. Starr': A 'Definitive' Account". NPR.org. Retrieved September 1, 2018. ^ "A Chronology: Key Moments In The Clinton-Lewinsky Saga". www.cnn.com. Retrieved September 1, 2018. ^ Barkham, Patrick (November 19, 1998). "Clinton impeachment timeline". the Guardian. Retrieved September 1, 2018. ^ "CONTEMPT?". PBS. August 6, 1998. ^ a b c Bendavid, Naftali (August 7, 1998). "Reno Cited For Contempt". tribunedigital-chicagotribune. Retrieved September 1, 2018. ^ "10 politicians threatened with contempt - 6 of 10". www.politico.com. Retrieved September 1, 2018. ^ Roig-Franzia, Manuel (September 18, 2002). "Reno Concedes Defeat in Fla. Primary". The Washington Post. ^ "Department of Criminology News". University of Pennsylvania. Archived from the original on October 24, 2007. Retrieved January 5, 2008. ^ Simon, Stephanie (April 3, 2006). "Reno: Focus on science of preventing crimes". Daily Pennsylvanian. Archived from the original on July 25, 2011. Retrieved November 8, 2010. ^ "About Us: Board of Directors". Innocenceproject.org. The Innocence Project. Archived from the original on February 17, 2007. Retrieved February 15, 2015. ^ Salizar, Carlita (November 7, 2016). "In Memoriam: The Honorable Janet Reno". Innocence Project. Retrieved June 23, 2017. ^ "Tune In: Innocence Project Board of Directors' Director Emeritus Janet Reno on "The Simpsons" - Innocence Project". Innocence Project. March 15, 2013. Retrieved June 23, 2017. ^ a b c Douglas, Susan J. (December 31, 2018). "Remembering Janet Reno". POLITICO Magazine. Retrieved August 25, 2018. ^ National Women's Hall of Fame, Janet Reno. ^ "Council on Litigation Management". Litmgmt.org. Retrieved May 28, 2011. ^ "Former Attorney General to Receive National Award"[permanent dead link] AJS Media Release. January 15, 2009. Retrieved April 17, 2009. ^ Palazzolo, Joe (April 17, 2009). "Holder to Present Reno with AJS's Justice Award". The BLT: The Blog of Legal Times. Retrieved April 18, 2009. ^ a b Mundy, Liza (January 25, 1998). "Washingtonpost.com: Why Janet Reno Fascinates, Confounds and Even Terrifies America?". www.washingtonpost.com. Retrieved August 25, 2018. ^ "SNL Archives | Impression". SNL.jt.org. January 20, 2001. Archived from the original on September 27, 2011. Retrieved May 28, 2011. ^ "Chad Johnson's Super Bowl Party – NFL – Viral Videos". Spike.com. February 4, 2007. Archived from the original on January 23, 2011. Retrieved May 28, 2011. ^ a b Hanes, Stephanie (November 7, 2016). "Janet Reno, former U.S. attorney general, dies at 78". The Washington Post. Retrieved November 7, 2016. ^ "Pitchfork: Devendra, Andrew Bird, Danielson on Janet Reno Comp". June 26, 2007. Archived from the original on June 26, 2007. Retrieved May 28, 2011. ^ "Reno Collects the History of America Through Song". NPR.org. July 6, 2007. Retrieved June 23, 2017. ^ "Janet Reno". TVGuide.com. Retrieved November 7, 2016. ^ Samuelson, Kate (November 7, 2016). "6 Things Janet Reno Will Be Remembered For". Time. Retrieved August 27, 2018. ^ Izadi, Elahe (November 7, 2016). "How Janet Reno came to embrace Will Ferrell's absurd SNL impression". The Washington Post. ISSN 0190-8286. Retrieved November 8, 2016. ^ "Statement on the Passing of Janet Reno". whitehouse.gov. November 7, 2016. Retrieved August 25, 2018. ^ "Statement from President Clinton and Secretary Clinton on the Passing of Janet Reno". Clinton Foundation. November 7, 2016. Retrieved August 25, 2018. This article incorporates text from the Department of Justice Web site, which is in the public domain.